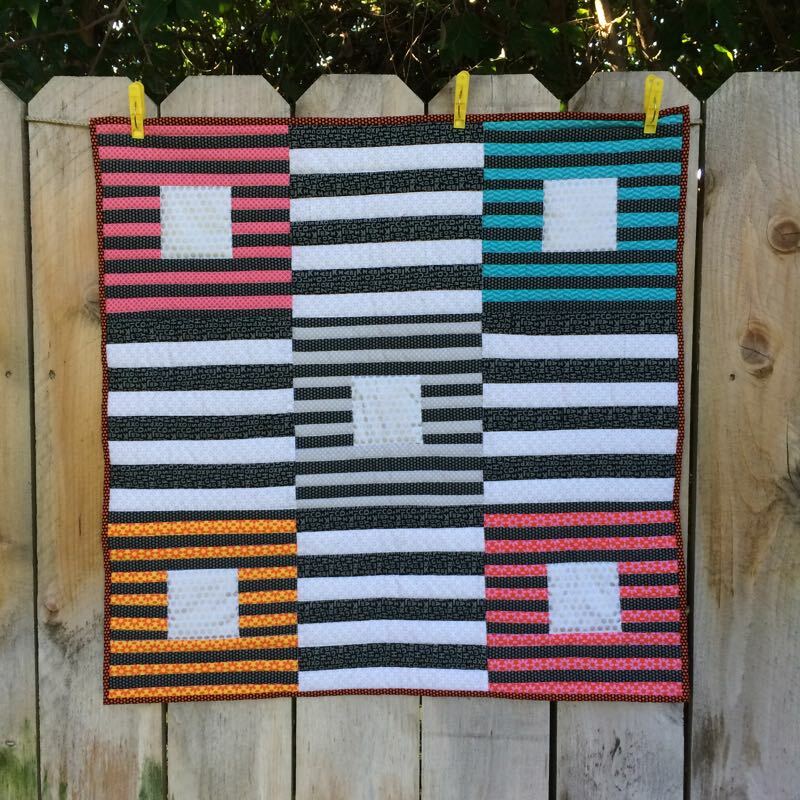 Illusion of Colors, based on a design by Kevin Umaña | OccasionalPiece--Quilt! Posted on November 17, 2016 by Elizabeth E.
This was the second of two designs I made using Uppercase Fabrics and designs from artist Kevin Umaña, who now lives in New York City. I first wrote about him when we started our collaboration, and he was a delight to work with and has great punchy graphic designs that translate well to quilts. I had this pinned up and awaiting quilting for the longest time. You all know that my shoulder has been giving me trouble (wah wah wah) and last week when I went for a 3-month check-up, the doctor said don’t do anything that hurts. Well…sleep hurts. Getting dressed hurts. Sitting quietly can hurt. And then I thought if I can’t do anything that hurts, I may as well suspend myself in green Jello or something. Or, since everything hurts, I’m going to quilt. That night, I finished off Kevin’s great design. Brenda thinks I should get a real ice pack, but this seems to work okay. I’m on my second one. And yes, I’m still going through doctor hoops, hoping one day to do stuff without hurting too much. 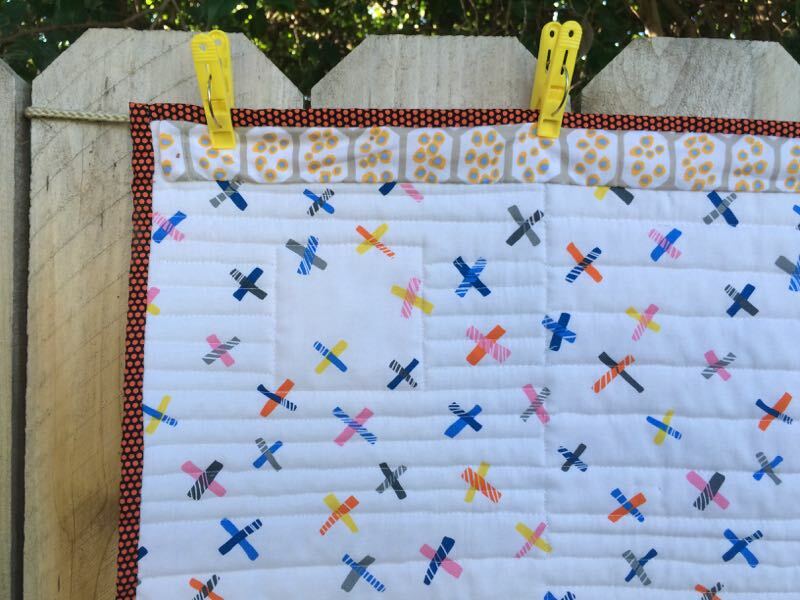 But I will keep quilting, because if I can’t quilt, what can I do? (No need to supply answers). I’m just happy to have finished up Kevin’s quilt. I’m mailing off to him as a thank you for sharing his designs. I love the graphics in those stripes. You did a great job with it. I can’t imagine you in a bowl of jello. How frustrating it must be. Chronic pain can be so tiring. I hope you manage to get through the hoops and get some help. 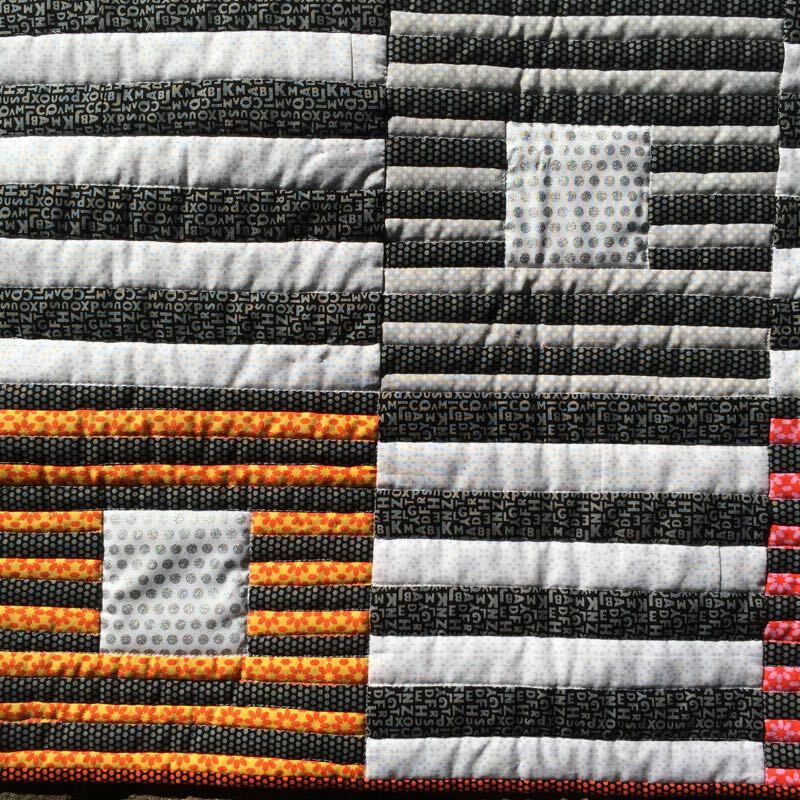 I’m sorry to hear that everything hurts, but I am glad that you can do some quilting anyway. I hope you get answers and some pain relief soon. I echo the well-wishes of the previous commenters- hopefully you will have some answers and relief soon! I love that you have been inspired by a ‘real’ artist!! (Can you hear the Australian sarcasm in my voice!?) Kevin will be proud to own an OPQ piece of art!! Lovely quilt. I applaud you for quilting with a shoulder that hurts. Hope you get relief soon. 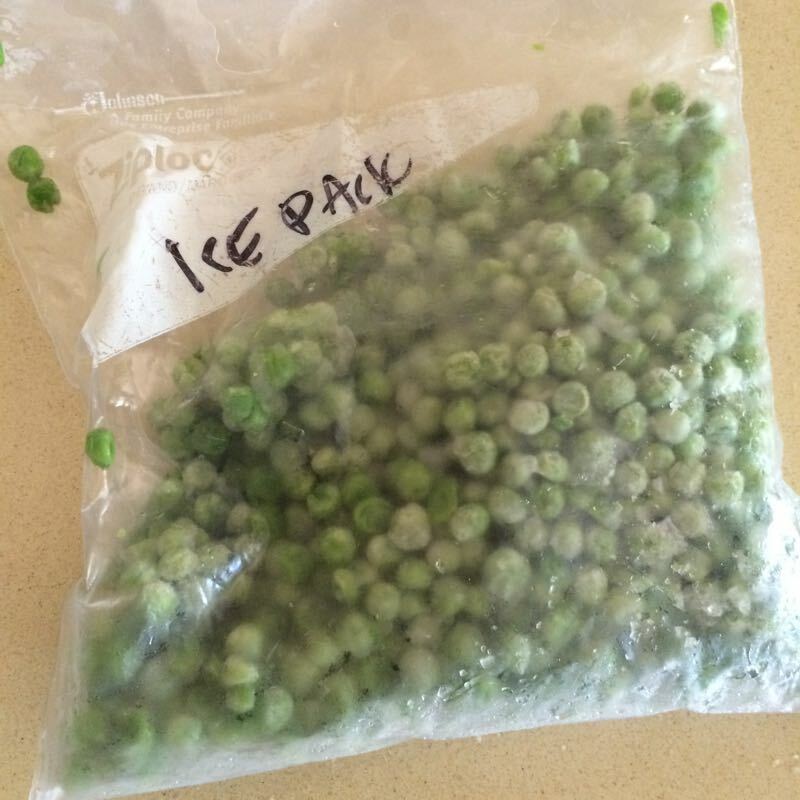 (I use frozen peas, too. They conform so well to the body.) 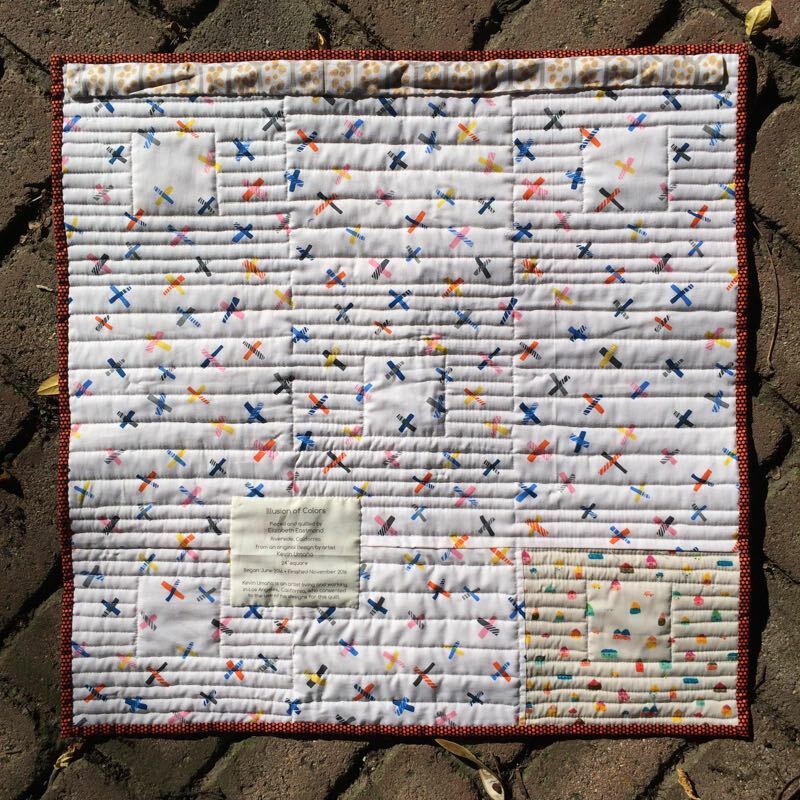 Thanks for the photos of the quilt. That quilt was a great collaboration. Hope your shoulder is feeling better. Pain is so inconvenient. When Loren was wrestling he liked frozen peas best, frozen corn was also good. Ice packs don’t conform as well to body shape.